Wales ( i/ˈweɪlz/; Welsh: Cymru) is a country that is part of the United Kingdom. It is found on the island of Great Britain. 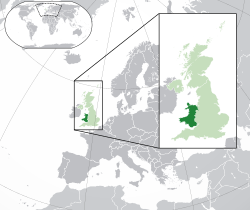 It is one of the six Celtic nations, and is to the west of England, and east of the Irish Sea and Ireland. The capital city of Wales is Cardiff, known in Welsh as Caerdydd. The main languages spoken in Wales are Welsh and English. Just under three million people live in Wales, and most people live in the south and east. The English words "Wales" and "Welsh" come from the old Germanic word Walh, which is Walha in the plural. Walh itself came from a Celtic tribe, called the Volcae by the Romans, which was eventually used for the name of all Celts and after that, to all people who lived in the Roman empire. The Anglo-Saxons who lived in England and who spoke Old English called the people living in Wales 'Wælisc' and the land itself Wēalas. Other areas in Continental Europe such as Wallonia and Wallachia, as well as some groups of people such as the Vlachs also have names that come from these origins. 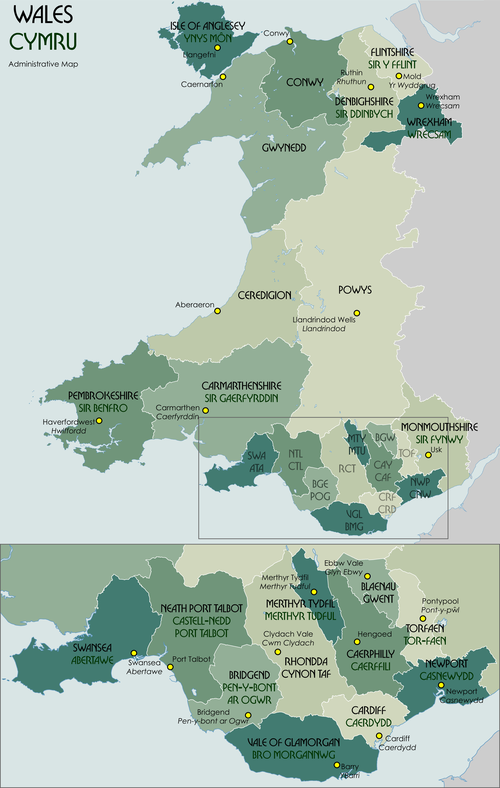 In the past, the words Wales and Welsh were used to mean anything that the Anglo-Saxons associated with the Celtic Britons, including other non-Germanic areas in Britain such as Cornwall and some Germanic territories associated with the Celts, such as Walworth in Durham and Walton in West Yorkshire,as well as things associated with non-Germanic Europeans like walnuts. After Llywelyn ap Gruffudd died in 1282, Edward I of England finished his conquest of Wales, which made it a part of England. Owain Glyndŵr was a Welsh fighter who managed to fight back the England and to restore independence to Wales, in the early 15th century. However, this didn't last for a long time, and after he was defeated by the English, the whole of Wales was taken over by England, with the Laws in Wales Acts 1535–1542. It took until the 19th Century for Welsh-centric politics to return to Wales. Liberalism in Wales, which was introduced in the early 20th century by Lloyd George, was overtaken by the growth of socialism and the Labour Party. However, Welsh pride got stronger, and in 1925 Plaid Cymru was made, which was the first political party to campaign for Welsh independence. In 1962, the Welsh Language Society was made to encourage the Welsh language, which had nearly disappeared during the take over by England. A big change was made in 1998, when the first Government of Wales for the country since its addition to the United Kingdom under the Government of Wales Act (1998). This created the National Assembly for Wales, known in Welsh as the senedd. The Senedd has responsibility for a range of laws which have been devolved from the main UK government in Westminster. This means the members of the Assembly can change certain laws in Wales to be different to the rest of the UK. Wales has a coastline which is 1680 miles long, and the country itself is 20,779 km2 large. The highest mountains in Wales are in Gwynedd, in the north-west, and include Snowdon (Yr Wyddfa), which is the highest peak in Wales at 1085 m (3,560ft). There are three National Parks in Wales: Snowdonia (Welsh: Parc Cenedlaethol Eryri), Brecon Beacons (Welsh: Parc Cenedlaethol Bannau Brycheiniog), and Pembrokeshire Coast (Welsh: Parc Cenedlaethol Arfordir Penfro). Welsh people are very proud of their country, and the first people in Wales to call themselves 'Welsh' were the Celts, who lived in Wales after the Romans left in the 5th century. The national emblems of Wales are leeksand daffodils. Although Wales is very close with the rest of Great Britain, and despite most people speaking English, the country has always had a distinct culture, and is officially bilingual in English and Welsh. Over 560,000 people in Wales speak the Welsh language, and in some parts of the north and west of the country, particularly in small, rural communities, the majority of people speak Welsh. From the late 19th century, Wales became famous as the "land of song", and for its eisteddfod culture festival. At many international sport events, like the FIFA World Cup, the Rugby World Cup, and the Commonwealth Games, Wales competes on its own, as a separate country. However, at most international events, such at the Olympics, Wales competes with the rest of the Great Britain, and sometimes as the United Kingdom with Northern Ireland included. Rugby Union is strongly associated with Wales as a national sport. Wales has four ferry ports. Regular ferries to Ireland go from Holyhead, Pembroke and Fishguard. The Swansea to Cork ferry which was stopped in 2006, but then opened again in March 2010, is under threat of closure again in 2012. ↑ "Statute of Rhuddlan". legislation.gov.uk. http://www.oxfordreference.com/view/10.1093/oi/authority.20110803100419253. Retrieved 26 July 2014. ↑ "Laws in Wales Act 1535 (repealed 21.12.1993)". legislation.gov.uk. http://www.legislation.gov.uk/aep/Hen8/27/26/contents. Retrieved 26 July 2014. ↑ "Government of Wales Act 1998". legislation.gov.uk. http://www.legislation.gov.uk/ukpga/1998/38/contents. Retrieved 26 July 2014. ↑ "Nominet announcement on the .cymru and .wales gTLDs". nominet.org.uk. http://www.nominet.org.uk/whoweare/whatwedo/our-products-services/cymru-wales. Retrieved 31 January 2014. ↑ Gilleland, Michael (12 December 2007). "Laudator Temporis Acti: More on the Etymology of Walden". Laudator Temporis Acti website. Michael Gilleland. http://laudatortemporisacti.blogspot.com/2007/12/more-on-etymology-of-walden.html. Retrieved 29 October 2008. ↑ Rollason, David (2003). "Origins of a People". Northumbria, 500–1100. Cambridge: Cambridge University Press. p. 60. ISBN 978-0-521-04102-7 . ↑ "Local Authorities". Welsh Assembly Government. http://new.wales.gov.uk/topics/localgovernment/localauthorities/?lang=en. Retrieved 9 September 2010. ↑ "Flights set to resume between North and South". WalesOnline website. Media Wales Ltd. 30 April 2010. http://www.walesonline.co.uk/news/wales-news/2010/04/30/flights-set-to-resume-between-north-and-south-91466-26346467/. Retrieved 6 June 2010. ↑ "Estimates of station usage" (Excel). 2011-12 report and data. Office of Rail Regulation. May 2013. http://www.rail-reg.gov.uk/upload/xlsx/station_usage_estimates_1112.xlsx. Retrieved 3 October 2013. ↑ "Business leaders back electric railway demand". WalesOnline.co.uk.. 25 January 2011. http://www.walesonline.co.uk/cardiffonline/cardiff-news/2011/01/25/business-leaders-back-electric-railway-demand-91466-28047043/. Retrieved 7 June 2012. ↑ "Britain's Transport Infrastructure, Rail Electrification". Department for Transport. 2009. http://collections.europarchive.org/tna/20100408232230/http:/www.dft.gov.uk/pgr/rail/pi/rail-electrification.pdf. Retrieved 7 June 2012. ↑ "Revived Swansea-Cork ferry service sets sail". BBC News website (BBC). 10 March 2010. http://news.bbc.co.uk/1/hi/wales/south_west/8561187.stm. Retrieved 19 June 2010. ↑ "Swansea-Cork ferry: Fastnet Line to close service with loss of 78 jobs". BBC News website (BBC). 2 February 2012. http://www.bbc.co.uk/news/uk-wales-south-west-wales-16854680. Retrieved 15 April 2012. This page was last changed on 11 December 2014, at 05:14.